Sarah and I were invited to spend New Year’s Eve with Bethany and Liam and his mum, Karen, at The Venue in Barkisland, Halifax. Liam was DJ’ing at the celebrations and, as it was something a little unusual (for S and I, anyway) we decided to attend. It was a good night. The food, a sumptuous buffet including Indian, Italian and French dishes, was delicious and the entertainment was enjoyable. A live band, The International Party Doctors, played two sets – we didn’t stay beyond 0030 to witness their second stint – and Liam “spun banging choons” to get the party rocking. I danced – my usual stand still and wave my arms style – with Bethany and Sarah and we all had a fab evening. I was deliberating all day over what my final image of the year for my “365 Project” would be and I decided to take an image of the evening. I was rather taken with a series of vertical lighting arrangements in which a series of LED lights projected atmospheric listing for the events. Here you have it in close up. I feel it is indicative of how most of feel come January 1st – the future is bright going into a new year and we all have dreams and ambitions to aim for. Some will not realise potential and some aims will not be achieved. But, for now, here is my bright start to the new year. Happy January 1st everyone. 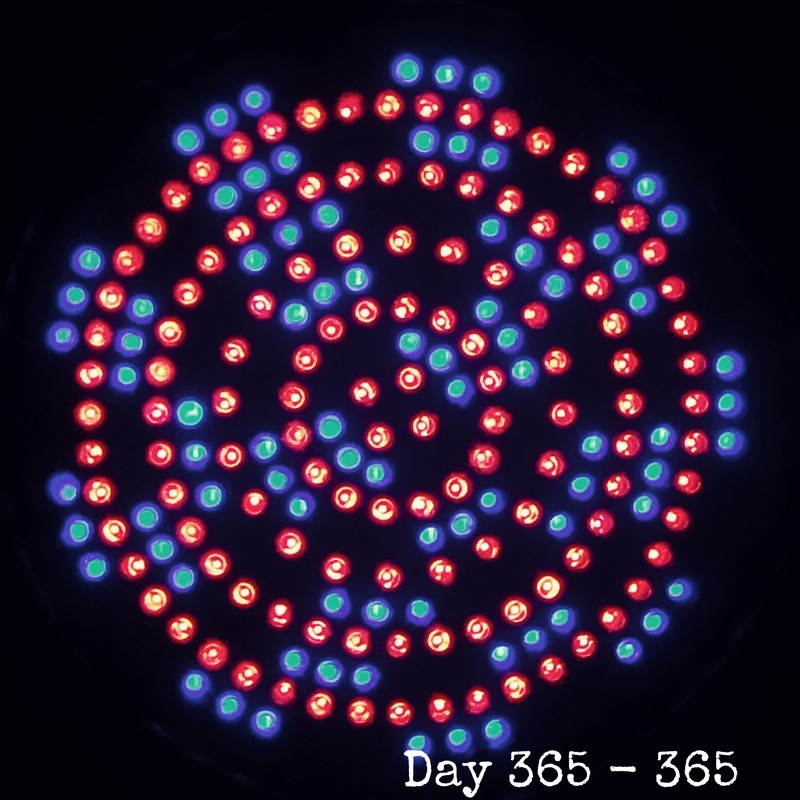 I hope you are all around in twelve months to see my second “365 Project” reach fruition.